Dual operation mode enables to connect various Music source devices. Enjoy new finr sound with brand new ESS SABRE32-2M ES9018K2M DAC. Dual separate headphone, Balanced output and Single end output. This product was high evaluation in Audio magazines review. RAL KEB02iP was high evaluation in Audio magazines review. RAL-KEB02iP has two operation mode, iPod® Compatible mode and USB-DAC mode. iPod Compatible mode works with iPod®, iPhone® and iPad®. Check compatible models listed at another side and get latest list at www.ratocsystems.com. 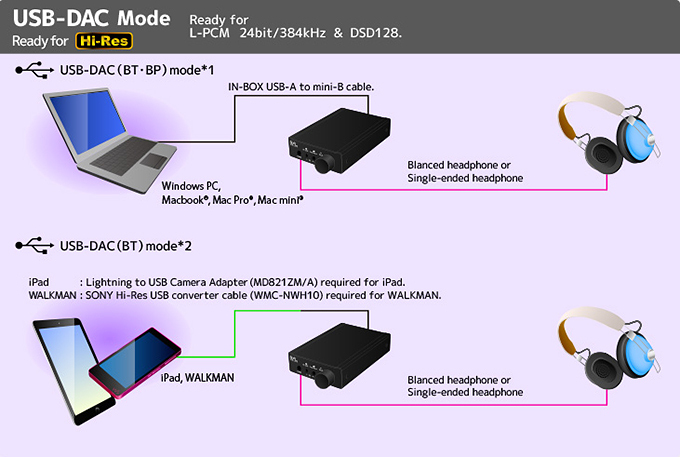 USB-DAC mode works as USB Audio Class 2 compatible Device with Windows® PC or Mac® running on MAC OS X 10.6 or newer. Notes: *USB Audio Class 2 driver for Windows is required Download from www.ratocsystems.com and install it to PC. RAL-KEB02iP has two USB operation mode and these mode works exclusively. The first one is an USB Host mode to communicate with Apple Device, iPod, iPhone or iPad with USB-A to 30P Dock Connector or Lightning Connector cable. In this mode, USB-A connector is enabled and KEB02ip works as an USB Host. Apple Device works as a Full Speed USB Device. As music data is transferred by Apple specified protocol, the resolution and sampling rates are limited to 16bit / 32k, 44.1k and 48kHz. This mode is set at iPod position of Mode Select Slide Switch. Another one mode is an USB device mode. In this mode, mini-B connector is enabled and KEB02ip works as an USB Audio Class 2 compatible High Speed device and supports 16 or 24 bit resolution, 44.1k to 384kHz sampling rate and native DSD2.8/DSD5.6(DoP format 1.1). This mode is set at BT or BP position of Mode Select Slide Switch. USB data transfer gets executed in Asynchronous Isochronous mode. RAL-KEB02iP derives Digital Music stream from iPod / iPhone / iPad, converts it to fine sound and drives balanced headphone with fully balanced analog circuit. Notes : MFi certification covers only this iPod Compatible mode and listed iPod/iPhone/iPad models. RAL-KEB02iP supports High Resolution Audio up to 24bit/384kHz PCM and DSD128. Full Balanced Circuit and Balanced earphone output. Incoming Music data through USB is converted to I2S(PCM) or DSD music data stream clocked by accurate 22.5792MHz (512*44.1kHz) or 24.576MHz (512*48kHz) X-tal Oscillator modules and then transferred to DAC. 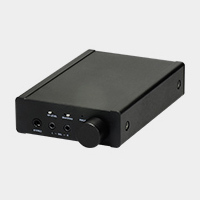 KEB02iP has High-grade Audio File Class DAC, ESS ES9018K2M. The DAC includes Jitter-Free processor, selectable digital filters and brings low distortion(-120dB), high DNR(127dB), accurate decoded analog signal and pure high quality sound. The analog circuit after DAC is consisted of fully balanced circuit from DAC out to earphone driver. The circuit includes four independent I/V converters, six independent filters and six independent amps. The output level volume of all six amplifiers are controlled digitally by only one DSP Master Volume controller in ES9018K2M to avoid gang error at low volume level(*1). The fully balanced circuit and balanced connection of earphones bring good separation of L, R, accurate positioning of instruments and spreading of sound space. KEB02iP has high quality 3.5mm mini-jack and 2.5mm mini-mini jacks made by Japanese company Hoshiden, these jack are suitable for faint and low current audio signal, superior to environment resistance and have strong durability for plug-in-out(*2). (*1) DENON DA-10 Portable DAC uses analog double-ch. variable resister and had this gang error between L and R at low level (8 to 10 o'clock) and was claimed as an initial failure. (*2) Some Portable Amp manufacturers ALO or others use IRIS Connector(4P). But the connector was originally developed to drive telescope lens motor of security camera and to support high current and DC battery DC30V/0.5A. It is not suitable for faint and low current audio signal. Also, this connector does not have shield GND. RAL-KEB02iP has two convenient switches. Filter Selection switch enables to select Sharp roll off or Slow roll off digital filter curve. Output level Low/High selection switch enables to select headphone output level. Use these switches and set your favorite sound and level. RAL-KEB02iP includes two independent headphone amp for balanced out put(2.5mm-L and 2.5mm-R)and single ended output(3.5mm stereo). Balanced headphone driven with fully balanced amplifier brings good separation, good positioning of instruments and clear natural sounds. Ready for High Quarlity 24bit / 192kHz PCM (ESS ES9018K2M). Excellent full-blanced circuit design and firmware. 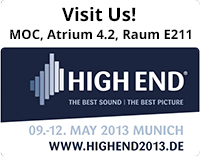 High grade two digital input, Coaxial and Optical. 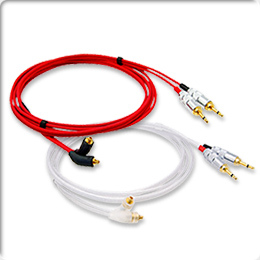 Includes cable for SHURE SE Series. 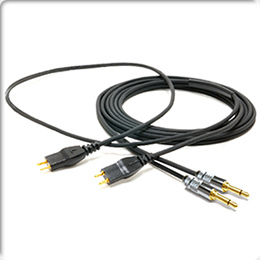 Includes cable for SENNHEISER HD25-1 II .